Additional Info: I studied at Sussex Downs College for a BTEC National Diploma in popular music in 2000. I received a distinction for a solo performance involving playing guitar & singing. After gaining my BTEC I received an acceptance from the Guitar Institute, at Thames Valley University, the entry requirements included the ability to play to grade 8 standard on the guitar and passing a grade 6 level theory and aural test, which I did, but I chose instead to study Music at the University of Salford. In my final year I elected to study composition, Arranging and advanced jazz composition and arranging. After being awarded a BA Hons in Music by the university of Salford I studied for a PGCE at the University of East London & passed my Trinity Guildhall Grade 8 piano exam. I have been involved in learning, teaching, composing & performing music my whole life, I am keen to pass my knowledge onto people who wish to learn music, especially the piano. I believe that with the right guidance from enthusiastic teachers like myself, people can realise any musical talent they have to its full potential & go on to excel themselves. I believe music should be enjoyable & that its never too late to learn, but also that people can also benefit from a good understanding of music theory. I can teach people of all ages the songs they want to learn in the comfort of their own homes or in my studio in Hastings. 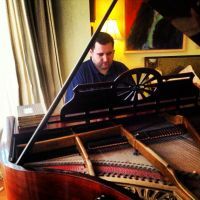 I have a wide repertoire of classical, jazz & contemporary music I can teach.